Goals and goal setting is a hot topic in business and personal development circles alike. Most people who haven't spent their formative years hiding under a rock have no doubt heard many impassioned pitches about the importance of goals, but just like eating your vegetables and going for a jog, most people don't think much about just why they're so important. Think of it this way, if you got in the car and just started aimlessly driving without a real destination in mind, there's a better chance of your toddler having an accident-free to a china shop than of you actually getting where you need to go. Even when you have a rough destination in mind (e.g. "I should probably drop Junior off at his first day of summer camp"), you still need to program the address into your GPS so you know exactly how to get there. Just driving in what feels like it's probably the way to the summer camp wouldn't quite get you there and you'd most likely just end up at Chick-fil-a (again). Humorous as this may sound, this is what most people do with their lives! We amble around our days with no real plan in mind, doing what feels like it's probably going to lead us in the general direction of happiness, success, or a better life. Then, we have the audacity to act surprised and depressed when we don't magically appear at our vaguely-thought-out destinations. 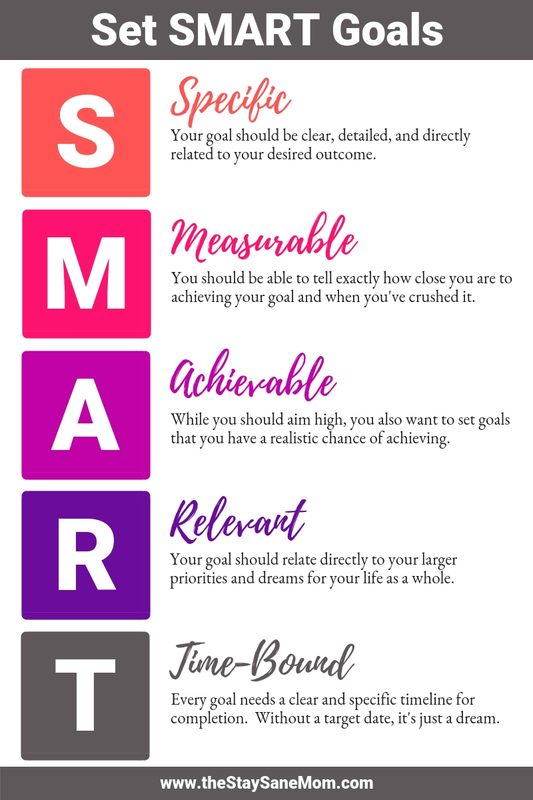 What's the Deal with SMART Goals? So if setting a goal is equivalent to knowing the name of your destination when you get in the car, making a SMART goal is like finding the exact address and printing out the directions on Google maps. Initially created in 1981 in a paper on management by a consultant to Washington Water Power Company (four for you, George T. Doran, you go George T. Doran), SMART goals have become a recognized concept in fields from business and management to fitness, athletics and education. In our car metaphor, this is the part where you figure out the exact address of your destination. You want to get to 333 North Broadway, not "Megan's friend's cousin's house". Out of our metaphor, in order to accomplish something, you need to be very clear on exactly what you're trying to accomplish. To come up with a goal that's appropriately specific, go back to grade school when they made you learn the "six Ws" (aka who, what, when, where, why, which...and how, who isn't a W but got lumped in there anyway to mess with you). When you make a really specific goal, it includes exactly what success is going to look like. This doesn't just help because it gives you clarity (though it really does and that can't be undervalued), but it also helps you visualize exactly what accomplishing your goal is going to look like, which helps increase your motivation, excitement, and likelihood to stick with your goal. Now, for each section I'll give you a few examples of goals that are not SMART and then their SMART-er equivalents. Not Specific Goal: I'm going to lose weight before summer hits. Specific Goal: I'm going to lose 30 pounds before school ends on June 2nd. Not Specific Goal: I'm going to be a better mom from now on. Specific Goal: Starting Monday, I'll only do work when the kids are asleep, I'll actively do homework with the preteen every day, and I'll plan one "spontaneous" fun family thing each week. In our car metaphor, this would be the equivalent of looking at the GPS directions for how far from your desired destination you actually are and then monitoring it as you got closer. A measurable goal is one that can be quantified (i.e. it involves numbers or other tangible measurements). This isn't there to turn your life into a spereadsheet, it's there so you know if/when your goal has been accomplished. The opposite of a measurable goal is a vague goal. You want to know exactly what "accomplishing the goal" will entail and, preferably, be able to track how close you're getting to it. Not Measurable Goal: I'm going to write more blog posts this month. Measurable Goal: I'm going to write at least two blog posts each week. Not Measurable Goal: I'm going to be a more attentive wife. Measurable Goal: Each night I'm going to ask my husband three questions about his day and listen to the answers. This is a quick double check for whether or not the goal is possible to achieve. In the car metaphor, maybe don't set out to drive from your house in California to Grandma's house in Colorado with only 20 minutes before Thanksgiving dinner? It's actually a lot more complicated than that because, in the real world, we often don't know whether a goal is achievable or not until we try it. Some of us set overly-cautious goals and miss out on possible achievement. Others of us *shamefully raises hand* set way too ambitious goals and then take a bubble bath in a stew of our own shame and self-loathing every time we fall short of what we should have known we'd never be able to do in the first place. My best advice on this front is to take the same approach professional athletes take to choosing the right weight to lift in the gym. Look at what you were able to do successfully last time and aim for one increment higher. If it works, aim another increment higher the next time. If you don't meet your goal, stick with that level until you do. Not Achievable Goal: I'm going to put in 4 hours of work a day while my toddler plays peacefully beside me. Achievable Goal: My toddler is a loveable little demon baby who will destroy my house if left alone for 30 seconds. I'm going to be really focused on work during naptime and work an extra hour after she goes to sleep. Not Achievable Goal: I'm going to eat only grapefruit and dry toast until I weigh what I did in high school. Achievable Goal: Eating is my only joy in life, but I'm going to order a medium instead of a large whenever I go to the drive-through. In the car metaphor, setting a relevant goal would be the equivalent of making sure you actually wanted to go to a destination before you drive there. Sure you could successfully drive to the nearest boat repair shop, but is that really what you want in your day? In the metaphor, this sounds incredibly easy, but in real life, this one actually takes a bit of soul-searching. People set goals for any number of reasons. Some are set because we want to think a certain way of ourselves, others are set to present a certain image to others, some goals are set in one domain but really stem from a completely different underlying need. Many of us set goals we think are good for us but aren't aligned with what we really want (like making yourself miserable over losing 10 pounds when you're actually fine with your current weight) or goals that are related to what we really want but aren't the quickest way to get there (think about that degree we got because it would look good on a resume but was the most boring experience on the planet). Overall, only you can tell if your goal is actually going to be relevant to what you want out of life, so instead of sample goals, I'm just going to give you a couple of question you can ask yourself to ensure that your goals match up with what you actually want. Will this goal impact my long-term happiness? Does this goal benefit my marriage, career, or family? Is this goal practically useful to my day-to-day life? Does this goal seem more desirable due to a lack of self-esteem in some specific area? Am I doing this because I think others expect it of me? Unlike relatedness, setting a time-bound goal is actually incredibly simple. Finishing up our car metaphor, setting a time-bound goal is like saying you need to arrive at the carpool pickup before school lets out at 3:30. Duh. For real goals, this means setting a real-life date and time you want to use as a deadline for accomplishing your goal. Not Time-Bound Goal: I want to reorganize the nursery. Time-Bound Goal: I want to reorganize the nursery before the next baby is born. Not Time-Bound Goal: I want to fix our budget. Time-Bound Goal: I want to hit our monthly budget at least once by December. The only other thing I want to put in this section is that, for bigger goals, it often helps to set waypoint or milestone goals along the way. This means you break down your big goal into smaller steps, and then assign each of those steps a due date of their own. This is kind of like the step-by-step directions your GPS might give you on the way to somewhere. This way, if you hit a snag and miss one of your progress goals or deadlines, you still have time to make it up before you miss a big goal. Finally (and I should make a way bigger deal of this, but you'll have to take my word for it) write your goals down. I could make a huge schpeal on the importance of writing your goals down, how it psychologically primes you to commit and achieve, how it heightens the likelihood of accomplishing a goal, and a million other reasons why it's important to write your goals down, but instead of bashing your face against the fact wall, I'll just let you take my word for it. Write your goals down. On that note, attached to this article is a free, fillable PDF worksheet that you can use to start organizing your goals. Pick one of your goals and use the worksheet to work through it. As you go, take note of the things it forces you to figure out that you didn't previously think about when you did "goal setting". Drop a note in the comments section for how this process changes things!